I was dragged out of the WV House Chambers because I listed Delegates’ campaign donors. – Holler from the Hollers! I was dragged out of the WV House Chambers because I listed Delegates’ campaign donors. As I tried to give my remarks at the public hearing this morning on HB4268 in defense of our constitutional property rights, I got dragged out of House chambers. Why? Because I was listing out who has been donating to Delegates on the Judiciary Committee. This is, of course, public information. Allow me to point out that if Delegates genuinely think that my talking about who their campaign donors are—and how much they’re receiving from corporate lobbyists/corporate PACs—is an ad hominem attack… then they should be refusing those donations. Yeah, refuse any donation that, if someone mentions it, makes you feel personally attacked. Because that’s not an attack. That’s guilt. And you SHOULD be feeling that. Let that guilt about who you’re really working for inform your votes; don’t let the corporate money do it. I’m Lissa Lucas from beautiful Ritchie County, WV, right in the front lines of the Marcellus. I’m a mineral owner. And I’m here to tell you that ALL of us, no matter our party, want our property rights protected. The attack on property rights is an assault on rural people, and it goes against both party platforms. While lobbyists have the money to buy your time at fancy gatherings like the Wine and Whisky gala at the Marriott on Wednesday—members of the public have been allotted just about 2 minutes each to make the case for our rights, so I’ll just have time to talk about four delegates. 12. WV LAND & MINERAL OWNERS PAC $250.00 The WV Mineral Owners Coalition is AGAINST this bill. This PAC is unrelated appears to be a front for out-of-state resource barons and attorneys who represent the energy industry. Delegates you cannot, without the appearance of impropriety—and likely without actual impropriety—vote for this bill. For those watching online or in the gallery, if your delegate votes to give away your rights to their corporate donors, you should get behind a candidate who’ll work for YOU, rather than someone who is getting paid to hand over your property rights to corporations. Save for Del Harshbarger, there are Republicans challenging them in the primary, and a Democrat who will challenge the winner, so in most cases there’s someone no matter your political persuasion. Full disclosure: There is a Democratic challenger for Harshbarger—that would be me. But I’m here to talk about the sale of our constitutional rights, not to campaign. So let’s move on to Delegate Armstead. Armstead is not a member of this committee, but he’s the guy who makes committee assignments for his party. His donors include the usual suspects—AEP, EQT, Dominion, FirstEnergy, etc. He got nearly $20K ($19,550) from energy donors, about 21% of his total. He seated on this committee everyone I’ve just talked about, and people I haven’t been allotted the time to talk about. Yeah, he’s working for those same donors, too. Delegates, voting to help the corporations that bought you is moral turpitude. And if y’all vote to enable Big Government to tell tax paying citizens what we can do with our own durn property, you can bet there will be people like me coming out of the woodwork to challenge you… and to make sure you either represent the people, or you get the hell out. Im from Harrison Co. but if you ever run for governor, you would deffenatly have my vote! Ive been telling people for years about the corporations ripping us off with our mineral rights & supporting our seats within our government! The best part is, I dont even own any mineral rights & I still know whats going on & never did think it was right. It wasnt right for them to remove you either! They just dont want people of this state to know the truth! FREEDOM OF SPEECH! Thats our right as Americans! Lissa, it would be very helpful if you would publish the dates for each blog post. Can you change the settings for that? Thanks! If you look at the URL of any post on the blog, you should be able to see the date of publication right there. 🙂 Hope that helps! CTA: Tell your State Senators “Fight for our property rights!” – Holler from the Hollers! The HOLLER Heard ’round the World – Holler from the Hollers! The Jim Justice Coal Con – Holler from the Hollers! WV Working Families endorses Lissa Lucas – Holler from the Hollers! West Virginia Sierra Club Endorses Lissa Lucas – Holler from the Hollers! American Federation of Teachers – WV Endorses Lissa Lucas – Holler from the Hollers! What doesn’t go viral – Holler from the Hollers! Please help us reach our goal. I was dragged out of the WV House Chambers because I listed Delegates' campaign donors. Open letter: Screw You, Frank Rich. Will WV Dems crash and burn like national Dems did? In WV you can register to vote online. 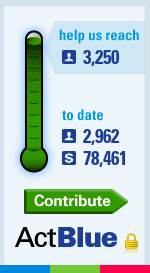 We're real grassroots, and DO NOT take donations from corporations or SuperPACs. Every small contribution from you will help fight the corporate control of our politics. Enter your email address to follow "Holler from the Hollers!" and receive notifications of new posts by email. Some people have always wanted to go into politics. Not me. I’d rather be hiking with my dog, to be perfectly frank. Or gardening… or making jam. Evidently we can’t leave governance to those who want to do it as a career. Sometimes regular people have to step in and demand we work on issues that will help people rather than engage in party politics. We need more public servants, and fewer politicians. So here I am. I promise to do what I can to straighten things out so we can all get going in the right direction again. We’re all in this together. Paid for by Team Lissa.